Thanks for your interest in our products. 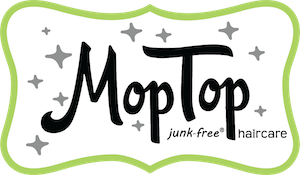 MopTop has two separate product lines – our Salon grade product line and our Natural, junk-free product line. MopTop SALON-GRADE products are richer, more emollient, with a higher concentration of ingredients. They are Paraben-FREE, with the exception of the salon Daily Conditioner. The salon products are available in retail sizes (2-12 oz) and professional sizes (32 oz), and have a higher price point ($9.99 – $43.95). MopTop NATURAL products are infused with aloe, sea botanicals, and honey. They are free of Parabens, Phthalates, Sulfates, Dyes, Silicone, and Wheat. The natural products are only available in retail sizes from 2-16 oz and range in price from $9.99 – $14.99. Also, the fragrances of the products vary from Salon to Natural, but they are all fresh-smelling and citrusy (we’re kind of known for the way our products smell – especially the Curly Hair Custard! ).